I am attending something called the Super ACAC conference this week in Reno, NV. It’s a rare combined meeting of three related organizations that cover California, the Pacific Northwest and much of the rest of the western United States. College admission administrators, high school counselors and independent college consultants are attending the conference. On my Facebook page on Monday, I asked folks to send me questions that they’d like me to ask higher-ed experts. Over the next few days, I’ll be passing along some answers. At lunch, I happened to sit at the lunch counter at the conference hotel with the head of college counseling at Francis Parker Schoolin San Diego and an admission rep from Villanova University. The three of us got into a discussion of merit aid versus need-based aid. Many colleges and universities are using merit aid scholarships to attract top students because these teens are as precious as gold in the admission process. Why? Because schools regard them as essential to help their institutions boost their US News & World Report college rankings. 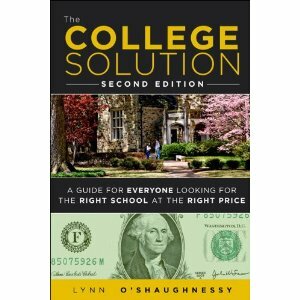 In the new second edition of my book, The College Solution (released this week! ), I devote an entire chapter to the destructive nature of the college ranking and schools’ mindless pursuit of better numbers.) Unfortunately families consider the rankings a proxy for educational excellence, which drives schools to compete furiously for top students. Many of the most desirable applicants are also rich. This isn’t surprising since these kids are more likely to attend better high schools and get higher SAT/ACT results since the test scores are tied to income. Students whose parents make $100,000 a year will do better on the standardized test on average than those who make $75,000 and the kids whose parents make $200,000 will do better than all those lower on the income ladder. At some schools, bright affluent students are getting bigger awards than the poorest students. There is nothing new about this, it’s been happening for many, many years. Schools need to devote a large chunk of money to attract the best students – regardless of their income – because they are the kids who enjoy lots of choices. If Villanova didn’t give their smartest applicants merit scholarships, they could end up attending schools like Fordham, NYU, Boston University, Syracuse and Lehigh. As an institution’s stock rises – students with higher academic profiles begin attending in higher numbers – a school can ratchet back on the merit aid to wealthy students. That’s what the Villanova rep says is happening at Villanova. That can free up more money for need-based financial aid. The most elite schools, such as the Ivies, don’t give any merit scholarhips at all because they are magnets for rich teenagers. Here is what I find so ironic about the system we are stuck with: if all schools just said no to non-need-based merit scholarships, the prices for all students would decline. After all, the colleges must make up for the yearly revenue lost through merit scholarships and that means raising prices. Thank you for the info! We’re on our 3rd child going to college next year and are frustrated with the financial aid/scholarship situation. We are a blended family which never seems to work to our benefit at all as the FAFSA goes by household income. The CSS Profile doesn’t seem to help us either even though that’s our chance to plead our case about already having two other kids in college. I think the ultimate frustration though is that our 3rd is first in his class of 700 kids, is captain/ president of several clubs, and works part-time. All this and Drexel just offered him only a minor scholarship! Still waiting on financial aid packets from Penn and Lehigh but we’re getting nervous :(. Any thoughts? Penn has excellent financial aid so if he gets in he will get a package based on your EFC. If your EFC is $25,000, for instance, you would get around $35,000 in aid and almost all of it would be in grants. Penn, however, doesn’t give any merit scholarships so if your EFC was say $60,000 he would get nothing. Lehigh says it meets 95% of a student’s need, but just 47% of students get that much. You should have better luck with Lehigh than Drexel. I hope he has applied to more than those three schools. What I find just plain unfair is how lower income families spend their money on unnecessary luxuries, clothes, jewelry, and cars they just cannot pay off. The middle class people who actually save their money and not spend it on the first thing that they see must use their hard earned money to pay the full price of tuition because their income & savings are just over the need-based financial aid bracket, and can not actually afford tuition without serious losses. Whereas, the lower income people are getting welfare benefits left and right from our expense! I think merit based scholarships are the only way for the middle-class stuck in the middle people to pay for college! Sorry, but I can’t agree with your comments. Low-income and middle-income families often struggle to pay for college. While I have learned quite a bit, the University in question was completely unable to better the Financial Aid package presented to my 4.0 GPA homeschool taught daughter. The package consisted of nothing but loans, and not adequate enough to get her through one semester much less 4 years for her degree. Are there no better options for a widowed mom, with 2 girls in school go receive more aid? The one is simply considering working minimum wage in Milwaukee, and working her way into one of their Community Colleges. Why not just do that from home, except Milwaukee is where she wants to be? I am sorry to hear about your experience. There are plenty of schools that are extremely generous to students whose parents are working single moms. In contrast, there are school that are stingy. It’s hard to understand what happened to your child without knowing what schools she applied to and which one gave her a package of loans. You are absolutely right about the ironies created by the convoluted college pricing/aid system we are currently stuck with. There are many relative “losers” in the financial formulas (for example, those who have saved but have not been able to put funds into protected retirement accounts, those whose children are spaced four or more years apart, or those who after many years have achieved a middle class income but can’t spend 50K/year for 8 or 12 years to pay for college). If you are one of the losers in this process, you will see that advocating that schools “say no” to merit-based scholarships is NOT in your interest. It is the way to go from a public policy standpoint, but for many, many families caught in the middle, following the merit awards has become a necessity. The system will not be fixed in time for our kids. I hate feeling that way, but costs have spiraled so far out of most families’ reach that the most a responsible parent can do is to try to find a way through this system that results in a positive education for the young people and financial solvency at home. BTW, I have your new book now and it is a winner! Thank you!! Lynn, I just ordered your new book from Amazon and am looking to having your wisdom in my hands! Thank you for the timely and pertinent college information that you unselfishly share. You make a difference and I, for one, am very grateful for your competence and passion. Thanks Paula! I appreciate you sharing your sentiments and I hope you like the book!